Shake it all up in a jar. Extra dressing will keep in the refrigerator. Optional: Parmesan Shavings to top. Line a serving plate with arugula or lettuce. Top with butterbeans, corn, cherry tomatoes, and onion. In a small skillet, that can also be used to blacken okra, bring about one inch of water to a boil. Add okra and boil for one minute. Remove okra, rinse under cold water, and cut each pod in half length-wise. Wipe skillet dry and return it to the stove. Heat olive oil in the skillet over high heat and add okra. Add the seasoning and cook until slightly browned - 2 to 3 minutes. 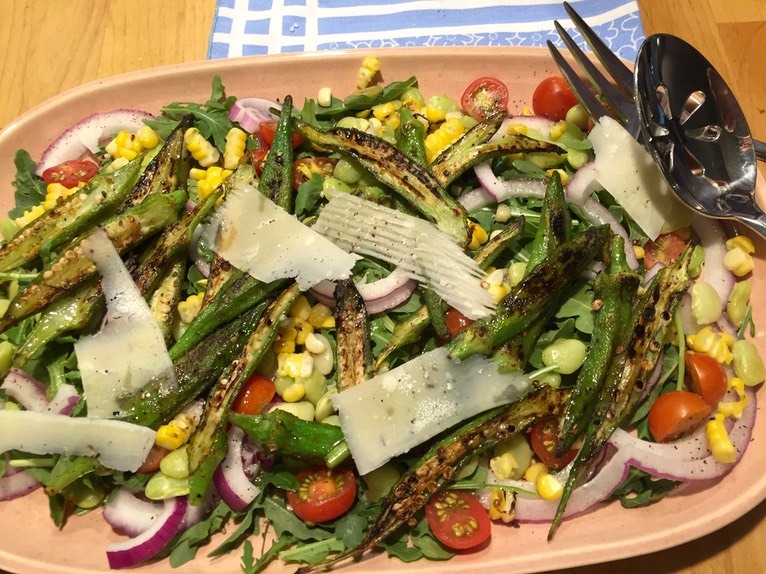 Top salad with okra, add dressing and Parmesan cheese if desired. Enjoy!